"Where did the idea of relocating to Tenerife come from?" is a question people ask since we've been living on Tenerife Island. 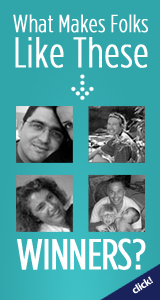 After all, we were proud Canadians for over two decades, so our moving to Tenerife came as a surprise for many. Well, the main reason for parting with beautiful Vancouver was to escape the "Wet Coast". Each year, by the time May was rolling around, we were dreaming about spending a whole month on a tropical island... The idea of trying out the Canaries came (completely out of the blue) on yet another rainy day after five and a half months of cold, damp, cloudy weather. We finally had enough. A brief visit here to make sure that - beyond the weather - relocating to Tenerife makes sense, and the decision was made. Fast forward a few months and here we are. 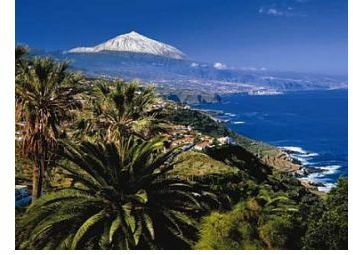 Off the North African coast, just across the pond from Florida, Tenerife’s subtropical climate is unbeatable. No wonder it's one of Europe's favorite year-round tourism destinations; in fact, the sunny, mild weather all year gave it the nickname of "island of eternal spring". The annual average is 22°C (72°F,) but temperatures vary throughout the island: 17-25°C (63-77°F) in the north and 23-28°C (73-83°F) in the south. A tiny speck in the Atlantic, Tenerife is the biggest of the seven Spanish islands in the Canarian archipelago, showing off breathtaking vistas and an incredibly varied vegetation on a mere 2,000 km² (800 square miles). From the majestic sight of Mount Teide’s peak at 3,718 meters (12,198 ft) towering above the island, dramatic volcanic landscapes around it and impressive once-inhabited caves, to the sloped vineyards between wild ravines, spectacular high cliffs, lush tropical forests in the north and sandy beaches with fabulous resorts in the south – you are enchanted at every step. And the locals... are simply charming! Warm, authentic, friendly, extremely hospitable and smiling all the time :-) This really made us feel at home right away! Tinerfeños are used to people who are relocating to Tenerife... There are more than a few who came for a pampering 10-day holiday and ended up returning to live here for good, or at least during the winter months. Most are British, Germans and Dutch, but there are many other North-Europeans who prefer this sunny, mild subtropical climate over the cold and rainy weather at home. ...since it's largely produced locally. Although Canarian economy relies heavily upon tourism, agriculture is still strong and sustainable, making the best of the rich volcanic soil and perfect climate year-round. 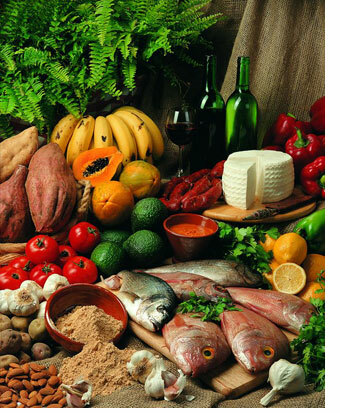 The farmers' markets abound with amazingly flavored local vegetables, tomatoes, bananas, succulent pineapples, oranges, papayas, mangoes, pomegranates, raw honey, wine, cheese, fresh herbs, the famous jamón serrano (dry-cured ham) - a delicacy even in the days of the Roman Empire. Also, some exotic fruits and veggies that are still a complete mystery to us now, quite a while after relocating to Tenerife. The fish comes from the island's own fisheries; you can have the freshest seafood in quaint fishing villages along the coast, for very decent prices. Livestock is mostly pasture-raised, including the local staple, Canarian goats (the mouth-watering barbequed "carne de cabra" and goat cheese in hundreds of insanely cheap varieties are a real delight). Canarian cuisine? Well, think Mediterranean gastronomy with a Spanish twist. And the local wines - well, for many, this alone would be enough reason for relocating to Tenerife ;) We have a hard time deciding on a favorite… but keep trying. The volcanic soil and sunny weather made this island a producer of exceptional wines. You can taste them directly in old winery cellars, or enjoy (for dirt cheap) in typical bodeguitas and toscas all around the island. ...when compared with Canada (especially Vancouver) and even for European tourists, the majority of visitors here. Not only the food and eating out cost less - outside of tourist areas it's only about 7 euros for a 3-course delicious, home-cooked meal plus local wine (that's less than 10 bucks); but gas and most merchandise are significantly cheaper too. 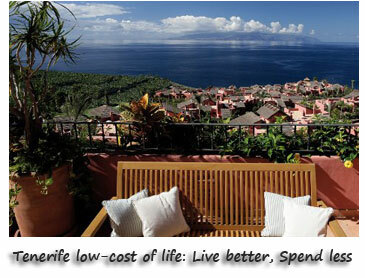 And there are other savings when living on Tenerife: a reduced sales tax of only 7%, low utilities bills and a one-climate wardrobe - all contributing to the higher amount of money you can invest. Plus, investing in real-estate here, in one of the most stable political environments, along with the other pluses (awesome weather, attractions galore, natural disasters-free area), yields increasing value to any property. Here "mañana" may literally mean "tomorrow"; in reality, it means "not today". Like all Spanish people, the Tinerfeños are devoted to their siesta. 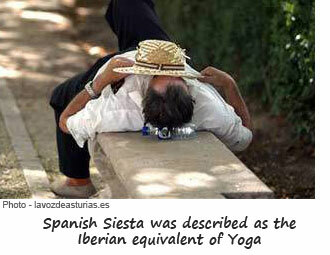 Siesta (or Yoga Iberico as they like to call it) is between 1-4pm, when most businesses close and streets become quiet as people like to have a nap after lunch. Tinerfeños are also devoted to partying year-round. Local fiestas with fascinating music, dance and fireworks are frequently held in all villages around the island. It all culminates with the famous Carnaval de Santa Cruz, when over a 10-day period in February/March performers and visitors arrive from all over the world to join the locals in the sweeping fiesta, dancing the nights away to the salsa rhythms in a stunning display of glittering costumes and feathery masks. Tenerife living means enjoying a perfect climate, much more sunshine than on Canada's West coast, lots of volcanic black sand beaches, clear air, plenty of fresh local food, a low-stress lifestyle... what can be healthier? In fact, this was our second reason for relocating to Tenerife. Living by the ocean is very calming; lying on the sun-drenched black sand, listening to the waves and feeling the fresh and salty breeze relaxes the little grey cells pretty fast. Barefoot walks on the beach give the feet a wonderful reflexotherapy massage... 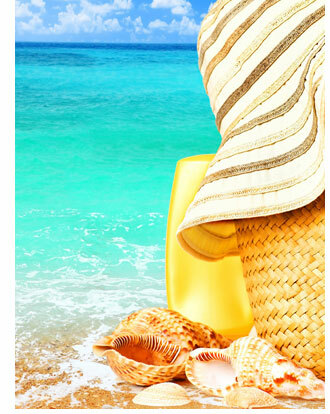 The many health benefits of sea water are innumerable; no wonder thalassotherapy is well-documented for centuries. Going to some of the luxury spas here got us hooked on the famous volcanic lava therapy and the rejuvenating full-body Aloe Vera wraps - offered along with some novel healing treatments and exotic massages. The bottom line is this. Tenerife's sunny days brightened our moods big time. 7. Fun and adventure are unending! With not one, but two world-famous theme parks, magnificent botanical gardens, top-notch golf courses and luxury spas, exciting shows and performers from all over the world hosted in Santa Cruz or the high-end resorts in the South, an abundance of volcanic black sand beaches, excellent windsurfing, diving and sightseeing spots, you can’t ever get bored while living in Tenerife. 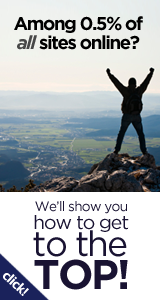 Temptations abound for every interest and fitness level. From exploring the breathtaking Teide National Park, visiting vintage wineries and centuries-old churches hidden on narrow, cobbled streets, to having a splash in the lava rock pools, to visiting the neighboring islands, swimming with dolphins, horse riding, whale trips, Jeep safaris and exhilarating 35-km downhill bike rides, to the more adrenaline-pumping thrills like paragliding, zip line stunts, rock climbing, walking inside lava tubes, there is so much to do and see here... and not enough time. ...No wonder more and more people are relocating to Tenerife nowadays. As well-established holiday spots, these Spanish islands are far away (not only geographically) from the old continent's social unrest, stemmed from the complicated birth of the European Union; so the Canaries are quite safe. Tenerife's crime rate is very low and there aren't any "no-go" places. Beyond a couple of heavily packed tourist areas in the South where loud music, party goers, late-night drinking (and even occasional pickpockets) may be annoying, the island is quiet and peaceful. Interestingly, unlike everywhere in North America, owning a car here is not a must. 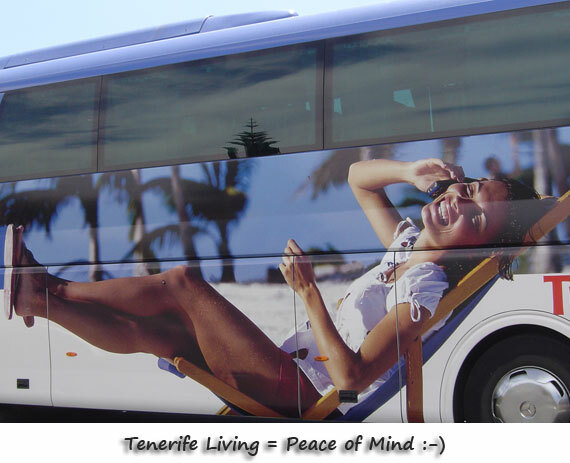 Public transport is exceptionally wide-spread and efficient, taking you from Mount Teide’s peak and the most remote beaches to the few bustling cities, shopping areas and the two airports on the island. Another plus to moving to Tenerife are the top-quality medical services available for a very reasonable fee (we pay here for private insurance half of what we used to pay in Canada as self-employed, and the coverage is more extensive). 9. 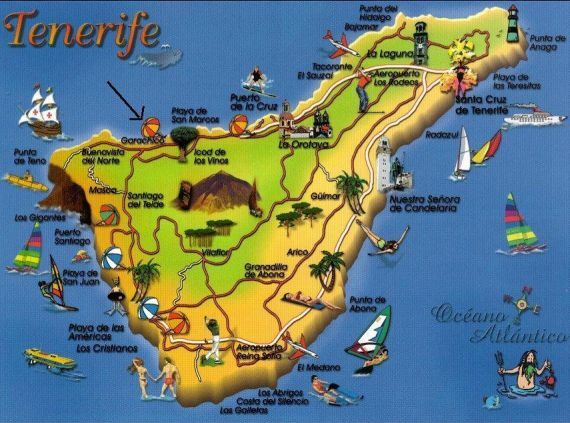 Tenerife's culture (distinctly Spanish) is simply fascinating! It reflects a rich history witnessing the mysterious Guanches arrived from Africa in the first century B.C., Christopher Columbus seeing Mount Teide erupting in 1492 while in Las Palmas en route to the New World, Spanish conquistadors taking over the island from the natives in 1494 after decades of fierce fighting, the British Royal Navy’s General Nelson losing his arm in the battle of Santa Cruz in 1797 and General Franco’s plotting to overthrow the Spanish Government in the 1930s while commissioned here - events you are reminded of by many historical landmarks when you’re living on Tenerife. Here, the traditional Canarian, Renaissance and Baroque architecture styles blend well with modern design, especially in the beautiful university town of La Laguna and in Santa Cruz, Tenerife’s cosmopolitan and très chic capital city. Here you can find everything, from lavish aristocratic Canarian mansions, neo-gothic churches and several fascinating museums (hosting contemporary art exhibits, military artifacts, a fertility goddess and even some remarkable Guanche mummies), to world-class theaters, fine restaurants, European-style cafes and nightspots, high-end shopping malls and much, much more. 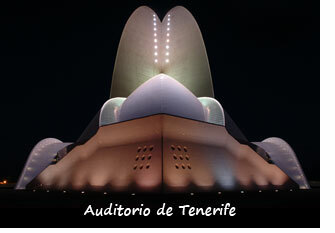 The striking Auditorio de Tenerife, Santa Cruz’s opera house and architectural landmark, one of the most emblematic buildings of Spanish architecture is full of technological innovation and home not only to the well-known Tenerife Symphony Orchestra, but a regular host of many cultural events and famous world performers. 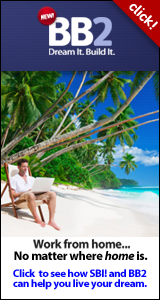 People often ask… if you wanted a warmer, sunnier climate, why didn't you choose the Caribbeans or Hawaii (like other North Americans making a living on the net and unbound geographically)? Well, while we considered both these tempting options seriously, for us Tenerife was the winner. Lastly, because with our European background and EU citizenship, this charming little Spanish island made us feel like home really quick! So looking back, relocating to Tenerife was a great move… it's a pity we haven’t come here earlier to enjoy it all! It may seem that all this is about convincing you to move to Tenerife--but it's actually not!